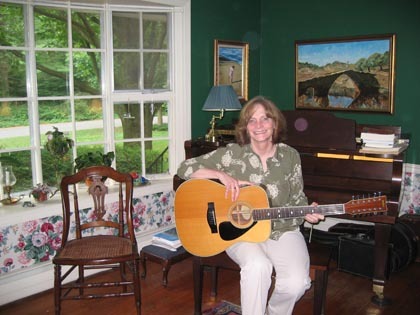 MUSIC, AND MORE: Princeton resident Pat McKinley is familiar to many in the area for her sing-along performances at local libraries. Her full-time job, though, is as an early intervention specialist, working with young deaf and blind children, and older adults. For the past five years Ive been working for Childrens Specialized Hospital in Hamilton as an early intervention specialist. I basically had to go back to work because my husbands full-time job disappeared with all the technology work being shipped out of the United States. I had been working  prior to the music  with the visually impaired and the deaf-blind, and the deaf, so thats what I went back to. I work with babies, up to three years old, who are deaf, blind, visually impaired, hard of hearing, or any combination. Multi-sensory impairment is really my specialty. The beauty of this job is that I can continue with my singing. One of my biggest fears was that I wouldnt have time for singing when I went back to work. But Im assigned to clients, and I make my own schedule. I did have to cancel pretty much all of my nursery schools, but I still do three libraries on Tuesdays, and one or two libraries every Friday. I was just called by the North Brunswick Library. They saw an article about me singing in the Monroe Library, and they said get her in here. So Im going to start there once a month. Periodically, Im asked to do a wedding or something special like that, and I still do birthday parties. So Im busy. Ive been doing the music for 21 years. I started at Mary Jacobs Library, in Rocky Hill. I brought my own children there for a program, and I thought this is great, Im going to sign up for another one. As I was signing up, the woman who led that days program was quitting. So I said, okay  let me present my case: I goof around on the guitar  Im not a professional singer  and I really think this is valuable. Once a month became twice a month, which became once a week, and I was actually doing twice a week there at one point. It spread out to other libraries, but Ive had to cancel some of the far away ones since Ive gone back to work full-time. Theres a movement right now that supports teaching sign language to very young children, and it works. I was singing at the Rocky Hill Library the other day, and when I finished a song there was a nine-month-old signing for more. So I said okay  and sang some more. Music is language. It uses a different side of the brain than speech uses, so if youre working with a child whos really multi-sensory impaired youre approaching a different side of the brain. Then you can add movement, signs, gestures. I created this thing called wand singing. I had a little girl who had very bad cerebral palsy and we were trying to do language with her. She was visually impaired, and she could understand some of the signs, but she really couldnt communicate with me. So I gave her a wand, and I started doing music with it: rowing motions, for Row, row, row your boat, alternating motions for the popcorn song; the happy and you know it song was up and down  and she was able to communicate with me. She let me know what she wanted with the wand. Ive also been working with senior citizens, which I love, because I do a different type of music with them  I get into real folk music. I go out to Woods Services, a residential facility in Pennsylvania, once a month for a couple of days. I do almost all the mentally impaired units. Even with the most handicapped  and you have some people there who are pretty much on life support  I have learned from the way their eyes shine and the way their bodies tic a little bit, what are their favorite songs. You learn what people love, and you give it back to them. I do some work at the Perkins School for the Blind in Boston. I love going there. Two years ago I went to a communications seminar there for the deaf-blind. They encouraged us to bring in videos, so this was a great opportunity for me to bring in a video of me working with a young child. I was doing music with her, of course. After we finished, the woman who was leading the course asked me for a copy of it, because she wanted to use it as an example of harmonious communication. Now she would like me to do a seminar with her. My undergraduate work was as an elementary school teacher, and I also studied special education and fine arts. Then I got my masters in visually impaired and learning education, and working with the physically disabled. I also have certification as a teacher of the hearing impaired. I picked up the guitar in college. It was my Christmas gift freshman year. Im self-taught. Woody Guthrie once said, if you know more than three cords youre a show-off, and I love that. I love playing the guitar, and I just love being with children. I love being with people. I had an art teacher in Mercy High School in Detroit, where I grew up. Sister Ignatius was very, very religious and so anchored  such an amazing human being. I was lucky to have her for four years. She said to us once that, no matter how devastating something is, how awful it appears on the surface, if you look closely enough theres beauty, and with that beauty you can create a painting. Some babies have pretty horrific disabilities. But you always find a way to make them smile.